More or less, the world’s central banks operate in concert with one another, often even cooperating hand in hand to help each other (whether it is in setting interest rates or foreign currency interventions). 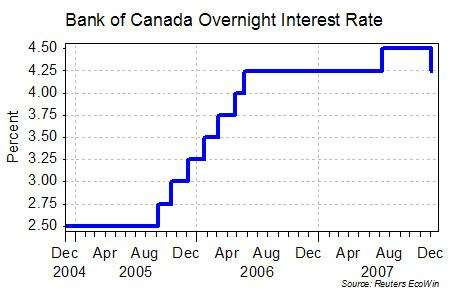 Today the Bank of Canada surprised everyone with a 25 point basis cut. Although the higher Canadian dollar had created concern about Canadian exports, most thought that the Canadian central bank would opt to leave rates unchanged due to a buoyant economy thanks to high commodity prices. Global financial market difficulties related to the valuation of structured products and anticipated losses on U.S. sub-prime mortgages have worsened since mid-October, and are expected to persist for a longer period of time. In these circumstances, bank funding costs have increased globally and in Canada, and credit conditions have tightened further. The Bank of Canada is also worried that the effects of the sub-prime mortgage crisis will dampen the US (and global) economies enough to diminish demand for Canadian exports. If the commodity markets are topping, then this would be a double whammy to the Canadian economy, so the Bank of Canada is smart to judge a “shift to the downside in the balance of risks”. Since central banks don’t just lower or raise rates in a random fashion, this change in stance is probably the beginning of a series of rate cuts. Following the built in assumption of another rate cut from the Federal Reserve’s meeting next Tuesday, the Canadian central bank is now set upon an easing campaign. The European, Australian and English central banks (or counterparts) will be meeting this week and my bet is that similar decisions will be coming out of those hallowed halls. Which would spell some relief for the poor old US dollar (and a cautious note for precious metal bulls). As a variable rate mortgage holder I would welcome falling rates to add to growing yields on investment property. A few thoughts the RBA might be having. * Rising AUD is not good for our exporters, and seeing as how our country is built on digging stuff out of the ground to sell overseas this is a real concern. * Cost of living is on a rocket.. I’m always impressed by how much prices are rising despite being in a ‘low inflation’ environment. * At some point rising interest rates will bite into the housing sector as there are a lot of overstretched borrowers out there I predict. Anyway it would be a massive shock to us Aussies if the rates fell, nobody is even dreaming of that.. It seems to be hold for as long as possible but prepare for more rises. Time will tell.